The new on-camera honeycomb grid set from Selens enhances the locking system by two rare-earth strong magnets, and the rubber band simply stretches over the head of most on-camera flash units, which provides a fast and secure way on flash head and is durable. It features the stackable system to stack as many modifiers on top of the grid as your heart desires.If you are looking for over the top light effects and extreme creativity, the brand new grid set from Selens will allow for endless possibilities. Item features: ★ To control light spill & narrow beam angle ★ Magnetic stackable system to add grid as needed . Overview:This 48cm/18.9" Godox Folding Octagonal Softbox produces soft and even illumination, widely used by professional or amateur photography on portraits, pets, jewelry or other products. When use it shooting portrait, will get attractive lights in the eyes. Comes three accessories- Silver Disc, Diffusion Cover, Honeycomb cover for different environment to create different effect.Features:Silver Disc: Reduce unnecessary shadow and concentrating light, enhance the stereovision and stereoscopic.Honeycomb Cover: Cover this octagonal softbox with the Velcro to control light spill and make the light more softe and even, add character eyes light.White Diffusion Cover: make light uniform diffusion, soft and nature.Unfolds like an umbrella for quick install. You do not need to buy expensive or bulky holders, or use annoyingly sticky hook-and-loop to attach Selens Universal Gels to your flash. Included with each Selens Gels Universal Kit is the Selens Gel-Band. Includes Duracell batteries. You'll love the range and exposure consistency. Wireless Flash Trigger. New design: Channel Selector outside the transmitter and the receiver. Insert the receiver's trigger output plug into your flash's jack. Power Input of Transmitter: 23A 12V battery (included). Other Magnetic Flash Modifier items in US Stock you may need: The new on-camera honeycomb grid set from Selens enhances the locking system by two rare-earth strong magnets, and the rubber band simply stretches over the head of most on-camera flash units, which provides a fast and secure way on flash head and is durable. It features the stackable system to stack as many modifiers on top of the grid as your heart desires.If you are looking for over the top light effects and extreme creativity, the brand new grid set from Selens will allow for endless possibilities. 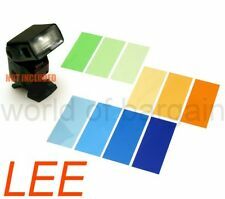 Item features: ★ To control light spill & narrow beam angle . Flash is in good condition. All battery connectors appear to be clean and free of corrosion. Flash has been tested and is in working order. You'll need AAA. Used as photographer in the last 3 years. On & Off button is a little bit lose but it works 100%. 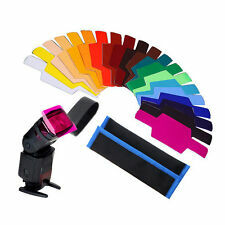 ThePrecision Design 12 Color Gel Flash Filter Set with Fastener will add drama and create specific moods with color. 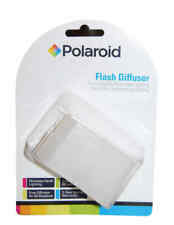 Just slip a color gel into the clear sleeve holder and use fastener strip to attach it to virtually any flash head. This trigger is designed for photographic studio and on-location work to trigger various flash lights. Each receiver works with one studio flash. Channel Selector outside the transmitter and the receiver. Leica M3 PC Flash S ocket Covers. Condition is Used. Wein L8 Flash Slave Trigger- Used. Product Description Godox Round Head Accessories Adapter S-R1 Pergear Cleaning Cloth Description： Round head accessories adapter S-R1 can make Godox camera flashes e.g. : V860II, V850II, TT685 and TT600 series install AK-R1 round head accessories to achieve creative light effects. It can also be attached on camera flashes of other brands, e.g. Canon. Nikon, Sony, etc. Features: 1. It is suitable for Ak-Ri round head accessories. 2.Adjust the screw on the top to install camera flashes of different sizes. 3. With grid rubber mats to tightly fix camera flashes and protect their surface Package Content：. JJC CABLE-BPCA1 is the connecting cable of JJC BP-CA1. JJC CABLE-BPNK1 is the connecting cable of JJC BP-NK1. for Nikon SB-910 / SB-900 / SB-5000 and Nissin Di866 for Nikon / Di866 Mark II for Nikon / MG8000 for Nikon. VIXIA HF21. VIXIA HF M30. VIXIA HF M300. VIXIA HF M31. VIXIA HF M32. VIXIA HF S10. VIXIA HF S100. VIXIA HF S11. 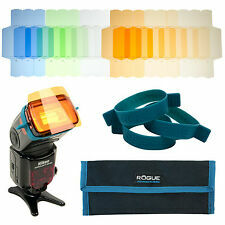 The Honl Photo Color Effects Filter Kit adds a creative touch to your Honl Photo Speed System light modifiers. It allows you to add various colors to your lighting source, from high-quality polyester gels from Lee, a leading manufacturer. The gels are durable and fitted with hook-and-loop adhesive upon the edges to quickly attach to Honl Photo's Speed Straps. Quantum Battery 1 Flash Battery Used Working. We have 5 available so you likely won't get the exact one pictured but they are all in similar condition. Used but working. Comes with battery and power supply as pictured. They all hold a decent charge (see picture of lights showing it is fully charged). Please see our other listings, we have some that don't seem to be working as well as the various cables to connect to the flash. Please message us with any questions or offers. Dont miss your opportunity to own one of these! It is the CM-4 model for the potato masher style unit but check with the QTM website to verify it's the right cable for your flash. It is new but I lost the box, if I find it, I'll include it. About the Rogue FlashBender 2 Mirrorless Soft Box Kit Specifically designed for mirrorless and compact design speed-lights, the FlashBender 2 Micro Reflector is optimized to handle the light output fromsmaller flash units. QTB Quantum Turbo Battery Pack.. Condition is Used and untested but looks great and don’t see reason why it wouldn’t work. 8 x Color Gel FiltersQuantity:2. You can use combinations of these filters to create different effects, such as cool effects, enhancing skin tone in portraits, color correcting or matching ambient, simulating different kinds of light, cheating white balance etc. For Nikon D200 D2X S3 S5. OEM Charging Port Flex Cable For HTC Incredible 2 ADR6350, Incredible S PG32130. We might require you to send us photo/s of the item received and also your original item so we can compare and conduct necessary actions. 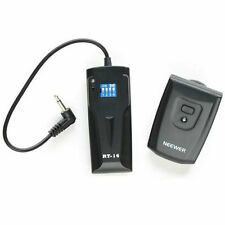 JJC MSA-2 Sony Camorder Active Interface Shoe (AIS) to Universal Shoe Adapter. This adapter converts Sony Active Interface Shoe to a universal hot shoe. 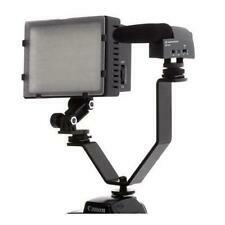 User can mount a LED Light or Mic with universal hot shoe to the camcorders. The Westcott Micro Apollo light modifier eliminates red-eye, brightens colors and softens harsh light from flash. excellent condition. Sto-Fen Omni-Bounce diffuser set for flash. For example, using it you can install NIKON SC-28 FLASH Sync Cord to FLASH SHOE, or you can install YONGNUO CTR-301P Flash Remote Trigger to Flash Shoe. For auxiliary flash or accessory. We will give you a satisfactory solution for sure. Item features: A simple and useful gadget to attach different accessories with magnet to your shoe-mount flash like light sphere, bounce, etc. Features the strong elastic force to hold accessories Two freakishly strong rare magnets embedded in the rubber Silica gel to withstand the high temperature and be weather-resistant Fits on virtually any size shoe-mount flash Item specification: Model: MN-AM Material: Silica Gel Size: approx. 90 x 45mm Item included: 1x rubber band Notice: NOT include other Accessory!!!. Profoto Air Remote TTL-C for Canon. Shipped with USPS Priority Mail. Precision Design PD-FD270 Bounce Flash Diffuser for Canon Speedlite 270EX / 270EX II. Precision Design PD-FD270 Bounce Flash Diffuser for Canon Speedlite 270EX / 270EX II with ThePrecision Design PD-FD270 Bounce Flash Diffuser creates a diffused bare bulb effect, and is designed specifically tofit the Canon 270EX / 270EX II Flash Units. Designed for: Canon 580EX & 580EXII. This diffuser is designed to fitdirectly on top of your flash head to soften the light and create an even dispersion of light on your subject. This eliminates harsh and unappealing shadows.